Now entrenched as a Southeast tradition -- it's the annual Moreland Monster March! 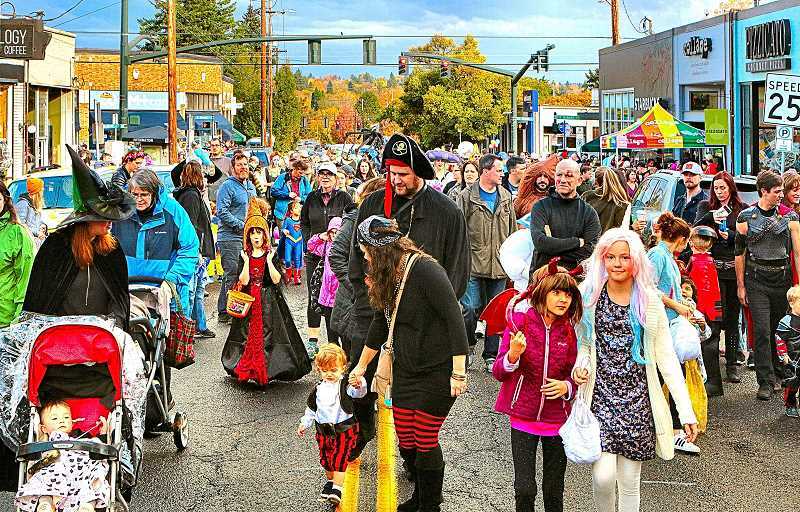 A tradition started by two Westmoreland neighbors in 2001, conceived simply as an uplifting event after the "9/11" tragedy, the "Monster March" has become probably the largest Hallowe'en celebration in Inner Southeast Portland. For years now, it's been organized and by the Sellwood Moreland Business Alliance (SMBA), and this year it took place on Sunday, October 28. The procession stages each year at the entrance to Llewellyn Elementary School on S.E. 14th Avenue, but families always add to the throng along the way. The parade grows as it travels east on S.E. Tolman Street, heads south on Milwaukie Avenue to Bybee Boulevard, pivots west to 14th, and returns north to the school again. For years, the front end of the March arrives back at the school before the back end has finished departing. Many stores and businesses along the route hand out candy and other treats; PDX Sliders gave coupons for free kids' burgers. Passing rain showers didn't dampen the spirit of the revelers; all remained merry as they walked with family and friends during this unique annual parade. And when everyone had completed the circuit they were treated to refreshments by local merchants on the playground of Llwellyn Elementary School, still clad in creative and spooky attire.